Petroleo Brasileiro SA, the Brazilian oil company that plans to spend $112 billion over five years to expand operations, and Mitsui & Co. signed an agreement to study the extraction of oil from shale deposits in Utah. Petrobras, as the company is known, Mitsui and Oil Shale Exploration Co., based in Vernal, Utah, will study the development of more than 30,000 acres (12,140 hectares) of leases containing an estimated 2.7 billion barrels of recoverable shale oil, according to statements from the companies today. Petrobras and Mitsui each have the right to as much as 20 percent of Oil Shale Exploration, the largest non-government holder of oil-shale rights in Utah. The U.S. has an estimated 2.5 trillion barrels of oil shale, more than double the world's 1 trillion barrels of conventional oil reserves, said Daniel Elcan chief executive officer of Oil Shale Exploration. The estimated amount of recoverable oil is about half to a quarter of Petrobras' Tupi field, a 5 billion- to 8 billion- barrel Brazilian offshore discovery announced in November that is the biggest Western Hemisphere oil find since 1976. With oil prices at all-time highs, alternative oil sources such as shale and oil-sands have become commercially viable and new U.S. leasing rules have opened up shale reserves to oil companies, Eclan said. He expects to be producing oil from shale in three to four years. Shale is a fissile rock composed of layers of claylike, fine-grained sediments. Oil is extracted from it by heating and distilling. The shale on Oil Shale Exploration's private and government-leased properties will be mined underground. Petrobras's oil-shale extraction process uses low temperatures, has no moving parts and produces far lower carbon emissions than making oil from other alternative sources such as coal, he said. Water isn't needed to operate or cool the process; it is a byproduct of their system, said Demarco Epifanio, the Petrobras International Unit executive responsible for the project. Petrobras, which has been producing oil from shale commercially for 30 years in Brazil's Parana state, is seeking to expand oil output in the U.S. and other markets and to use its patented Petrosix processing technology to diversify the sources of oil, according to the statement. 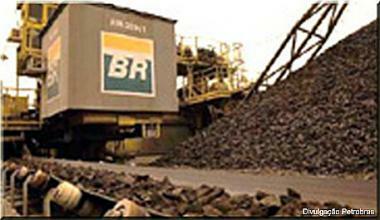 The company only produces about 3,800 barrels of oil a day using its process in Brazil. If it's proven viable, the Utah project, which will receive $12 million for studies over the next 12 months, can produce much more, Epifanio said. Expansion of shale-oil output in Brazil has been limited by cheaper sources of oil from the country's offshore fields. Petrobras refines kerosene, fuel oil, cooking gas, and naphtha, a raw material for plastics production from shale in Brazil. ``We want to save our reserves of shale right now, it makes more sense to develop offshore oil,'' he said. The U.S. has the world's largest reserves of oil shale, Brazil's reserves are the second-largest, he said. Petrobras preferred shares, the company's most-traded class of stock fell 11 centavos, or 0.2 percent, to 47.48 reais in Sao Paulo.